The gallery on the Galaxy Mega 6.3 can be sorted into albums, all photos and videos, time, location, etc. Just like in the phonebook, you can choose what kind of content should be displayed - photos and videos from the phone, Dropbox, Facebook or Picasa. You can pinch to zoom in the gallery and thus manage the size of the thumbnails. Air view works in the gallery as well. You can hover over an image and you'll get a bigger thumbnail overview or you can use it to peek inside folders. The Galaxy Mega 6.3 is great for viewing photos - the screen is as big as most photo frames and the lower resolution doesn't really show. The great viewing angles do, however. You can print photos straight from the gallery, though this only works on Samsung printers. The My Files app hasn't changed really - it's an efficient and simple to use file manager. It can move, copy, lock and rename files in bulk, even send multiple files to another phone. My files will only browse the memory card and the large internal storage (it can't access the system drive). We wish Samsung had the same sidebar with the folders on the left, just like in the gallery. The TouchWiz music player on the Galaxy Mega 6.3 is jam-packed with features and supports a wide variety of file formats, including FLAC, Wave, etc. Then there's Music square - it's quite similar to the SensMe feature of Sony smartphones. It automatically rates a song as exciting or calm, passionate or joyful and plots those songs on a square (hence the name). Air View lets you hover over a square to see what kind of songs it holds. The Samsung Galaxy Mega 6.3 can also search for content on third party DLNA servers like PCs or other phones on the same network. 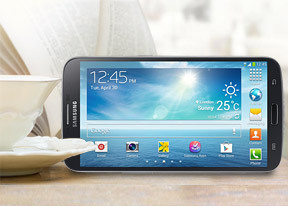 The Galaxy Mega 6.3 Smart Volume, which equalizes the volume between tracks. Adapt Sound from the S4 is also present. The video player, found on the Samsung Galaxy Mega 6.3 has the last watched video on top for quick access. Under it there are three tabs - personal (showing you the videos on your local storage), Download (which lets into the Videos store) and Nearby devices, which shows the PCs and players on your local Wi-Fi network. The video player lets you choose between three crop modes for how the video fits the screen. The video player lets you squeeze the best viewing experience out of the large screen. You can adjust video brightness, color tone and enable outdoor visibility too. Some of the same SoundAlive audio-enhancing technology is available here too. Hovering your finger over the timeline lets you preview part of the video in a small thumbnail - just like YouTube videos do when you hover the mouse. Pop up play is here too - it moves the video in a small floating window and you can use other apps on the phone while still watching the video. You can use pinch zoom to adjust the size of the video. Samsung should probably retire this feature in favor of a Mutli-window app. The Samsung Galaxy Mega 6.3 offered a list of subtitles and let us pick. It scans for all subtitles, so the file doesn't have to have the same name as the video file. The big disappointment here is the relatively poor video codec support. It plays XviD, MP4 and MKV files of up to 1080p resolution, but DivX is not supported. AC3 and DTS sound also do not work.